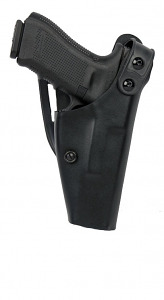 Level 1 mid-ride retention holster featuring a quick, yet secure thumb snap giving fast access to your weapon when you need it, yet remains grab resistant. Weatherproof thermoformed polymer performs in the most demanding circumstances while suede lined interior helps protect your gun's finish. Adjustable tension screw lets you adjust for a firm or easier draw. Fits Smith & Wesson M&P Compact/Full Size 9mm, .40 S&W, and .357 Sig.